It takes a lot of focus, preparation, and creativity to regularly make vegan meals for your family, but mom and popular chef Ann Gentry seems to have figured out most of the secrets. Founder of the Los Angeles vegan restaurant Real Food Daily, Ann is also the author of The Real Food Daily Cookbook and an experienced creative force. More recently, she penned Vegan Family Meals, a comprehensive resource on cooking healthy and delicious, family-style vegan food. She sat down with LoveToKnow to share her expertise on planning nutritious vegan meals, writing user-friendly books, and making plant-based food for your family on a budget. LoveToKnow (LTK): You've gone from a meat eater to an expert in the vegan field, what with running a home delivery business, founding your own restaurant, hosting a cooking show, and authoring enough original recipes to create a cookbook. How do you feel about the evolution process that has taken place with you? Do you think it's still happening? Ann Gentry (AG): My food journey began in my 20s and is still continuing. I grew up eating the standard American diet, and I didn't feel good most of the time. I've been experimenting with various vegetarian and vegan cuisines for three decades, starting as a young actress struggling with my weight and appearance, and today as a working mother and the proprietress of America's leading organic vegan restaurants, Real Food Daily. Over the years, I've explored the many permutations of a plant-based diet. I spent years as a strict vegan and a macrobiotic, and I experimented with raw foods, food combining, wheat- and gluten-free eating, and other dietary regimes. My experience has shown me that often people need different approaches to eating and nourishing themselves at different stages of their life. LTK: For you personally, what is the importance of a vegan diet? AG: When I first changed my diet to plant-based cuisine, I was able to finally get a handle on managing what I thought was an impossible and uncontrollable sweet tooth. When I made changes to what and how I ate, I did so primarily for health reasons. I wanted to feel and look better and live a healthy life, free of medications and food addictions. I also did not want the chemicals and hormones that are pumped into animals in my body. I didn't like the idea of how animals are so inhumanely treated. After years of eating this way, I realize that eating a primarily vegan diet supports my health and personal ethics, supports a peaceful world, and does very little harm to the environment I care greatly about. LTK: What advice would you give to someone who has no idea where to begin with vegan cooking? AG: One of the things I've learned in cooking for a family is that while it's nice to have the American-style four or five dishes at every meal, it's not necessary. I find that if I balance my nutrition across the week and don't get hung up on making every meal a feast, I can get my family's nutritional needs met. I've learned to stick with a plant-based diet, especially when cooking at home. Whole grains and vegetables are relatively simple to prepare, always accessible, and very economical. I like to prepare two or three recipes at each meal, which helps me keep my time in the kitchen shorter and far more enjoyable. Preparing and cooking plant-based meals encourages creativity in the kitchen. In Vegan Family Meals, I've included a real food pantry where I describe the many plant-based ingredients that are mainstays in my kitchen. I tried to demystify any of the new and unusual ingredients that are called for in plant-based cuisine and show how they are accessible and easy to work with. I like to use fresh, seasonal produce and a variety of cooking methods to create interesting and diverse tastes, textures, and colors on the plate. LTK: How can someone who wants to put vegan meals on the table do so without upsetting a meat-eating family? AG: I think a great place to start is to simply come from love, the love of wanting to share the new foods you are exploring with others. Serve the meal or the dish and don't even talk about what it doesn't have in it. Don't make a big deal out of it. Instead, highlight how delicious and satisfying the food is. Commit to serving an all-veg meal on Meatless Mondays, when hundreds of thousands of other people are doing the same thing. Maybe there is a particular holiday your family honors that is conducive to serving a new and different meal, or maybe your child wants to become vegetarian and you want to support her. I often teasingly say to people, "One vegan meal won't hurt you!" LTK: Describe the process of writing Vegan Family Meals. AG: Six years ago when my first cookbook, The Real Food Daily Cookbook, was published, I thought that it was going to be my one and only and that I had said everything I needed to say. Time, reflection, wisdom, two kids, eating at home as a family, new recipe ideas, and getting simpler and "cleaner" about what I eat all contributed to the genesis of a new cookbook. I also thought I had something to say as a busy working mother, because I struggle with the same day-to-day challenges everyone else has: juggling work, kids, grocery shopping, and trying to squeeze in time for myself. As I pondered what to say in a second book, I started looking at other cookbooks to see what attracted me and what didn't. I also talked to many home cooks about what kind of vegan cookbook they might want to have in their collection. In looking at books, I got turned off by the ones that pushed and sold the tenet that "fast, quick, and easy should be the goal in preparing meals." Just as equally, I felt frustrated hearing the misconception that healthy cooking means you spend all day long in the kitchen. I don't know who started that rumor, as that has never been my experience. Time is precious, but your good health is priceless. Spending time in the kitchen preparing good food for yourself is well worth it. Those were the motivators that encouraged me to write a second cookbook. I spent about five days a week during six intense months moving back and forth from my relatively small, funky kitchen to my dining room table. I have this nine-foot walnut dining room table where I set up shop. Lots happened in that corner . . . thank goodness for the two windows and the beautiful fig tree outside! I went through a whirlwind of emotions. The result is a book that contains simple vegan recipes with approachable ingredients and techniques accessible for all kinds of eaters. LTK: How do you come up with new recipes? AG: I like to eat out and explore all kinds of cuisines. When I like a recipe, I'll try to figure out how to make it. I aim to keep it simple and try to slim down on ingredients and steps. You can't do that with every recipe. There is a commitment to cooking and spending time in the kitchen-I think that is one of the smartest investments you can make in your health. I cook at home when not eating in my restaurants, and I tried out most of the recipes in Vegan Family Meals on my family. LTK: Some families can afford to make a move toward cooking with more organic produce and fresh, natural items, but the cost is still prohibitive for others, especially when processed products like frozen pizzas are so affordable. What are some small changes a family that is very strapped for cash could make to eat healthier? AG: Choosing fruits and vegetables that are grown organically is the best thing you can do for yourself and your family. Imagine holding an apple in your hand and spraying it with bug killer. Who would want to eat that apple? We don't see the pesticides, but that doesn't mean they aren't there. If this is a challenge in terms of availability or economics, that's understandable. Just don't cop out if you can't buy organic. Buy and eat vegetables. They are available at every grocery store and can be eaten in so many ways. Though fresh vegetables are preferable, shopping on a budget for frozen or canned vegetables is fine. Rice and beans are inexpensive, simple to prepare, and available in dried form in every grocery store across the country. LTK: Can you share a simple recipe with our readers? Whisk the lime juice, agave nectar, vinegar, salt, and chili powder in a large bowl to blend. 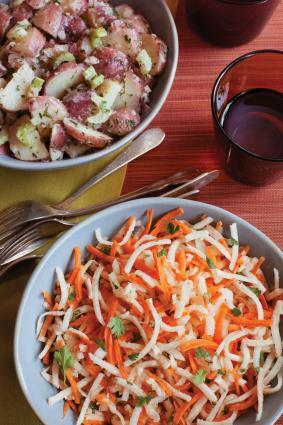 Add the jicama, carrot, onion, and cilantro, and toss to coat with the dressing. Cover and refrigerate the salad until it's cold, tossing occasionally, about 1 hour. LoveToKnow would like to offer special thanks to Ann Gentry for her time and insights on preparing vegan meals. To learn more about Ann, visit her website.